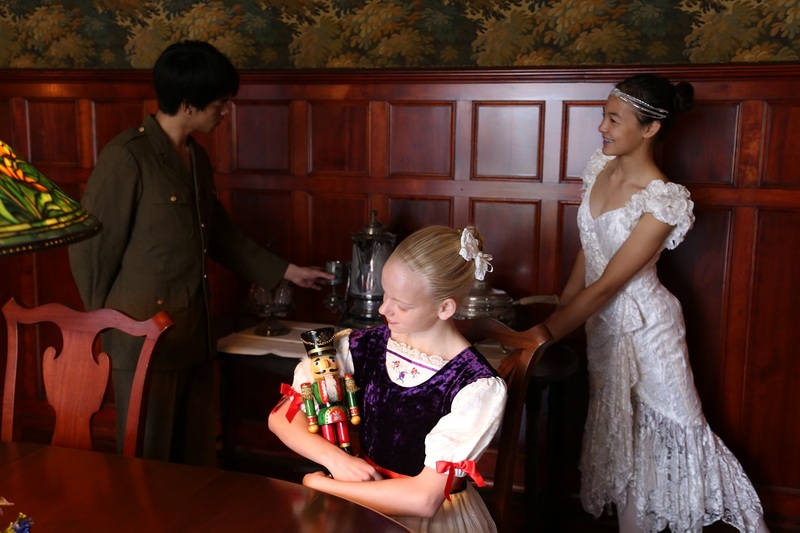 Maud Hart Lovelace and Betsy, Tacy, and Tib are all characters in a 1921 historical adaptation of the traditional holiday Nutcracker, presented by the Fine Arts School of Ballet in Mankato. 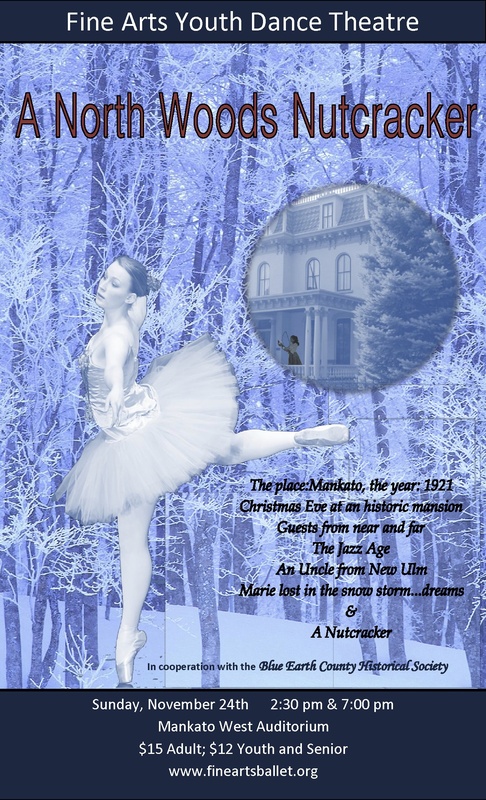 A North Woods Nutcracker incorporates the history of Mankato, New Ulm, and St. Paul, including a cast of historic characters, most notably F. Scott and Zelda Fitzgerald, Mankato-born soprano Florence Macbeth, the Hubbards, and Maud Hart Lovelace. In the first act of the ballet, a lively Christmas Eve party scene is set against a backdrop of the interior of the Hubbard House, as guests arrive and are announced. At the party Maud is reunited with her childhood friends Frances Kenney and Marjorie Gerlach. As they reminisce, three young girls representing “Betsy” and “Tacy” dance their first meeting with “Tib”. Florence sings songs from the era and couples waltz and polka. The Fitzgeralds show off the newest rage: the Charleston. As the party winds down, Uncle Drosselmeier from New Ulm presents his niece Marie with a Bavarian style Nutcracker he carved. The gift carries with it an idealistic hope for a world of peace, health, and freedom. When it starts to snow, Marie and her friends go sledding down Main Street Hill. When the snowstorm turns into a blizzard, a terrified Marie loses her way and is surrounded by coyotes and cougars. Suddenly, the Nutcracker comes to life as her brave Prince and summons up troops of both American and German soldiers. They join forces to protect Marie. An aviator crash lands and joins the battle, and a Red Cross nurse appears to treat the young soldier, as well as wounds on all sides. While stranded on the half-frozen river, Marie sees a vision of the Ice Palace from Mankato’s 1920 Winter Carnival, and the aviator and nurse are transformed into the Ice King and Queen. Freezing in the brutally cold Minnesota winter, Marie dreams of the perpetual spring in the hothouse of the Como Park conservatory, where she visited just before the Christmas party. The audience is transported to St. Paul in Act Two, which represents Marie’s pleasant reverie and showcases the diverse heritages within Minnesota, from the Welsh Singers of Cambria to the gymnasts known as the “New Ulm Turners.” Also in Act Two, Zelda Fitzgerald finally realizes her dream of becoming a professional ballet dancer when she assumes the role of the Sugar Plum Fairy in the ballet. The director, Annmarie Carlson Drake, has worked closely with Blue Earth County Historical Society in providing historical research and photos, as well as historically-accurate costuming and backdrop details. Annmarie is still looking for people to portray historical characters in the party scene and to help paint sets. If interested in portraying a character, contact Annmarie: amcdrake@hickorytech.net or if interested in painting sets, contact Kelly Dinsmore: kdinsm1@isd77.k12.mn.org. This spring the Betsy-Tacy Society received a grant from the City of Mankato to begin restoration on the second floor of Betsy’s house. Doug and Candy Laven (BTS restoration committee members) began the project this summer. It was a hot, dirty and dusty job working upstairs with no air conditioning during the summer months. Their progress can be seen in these pictures. 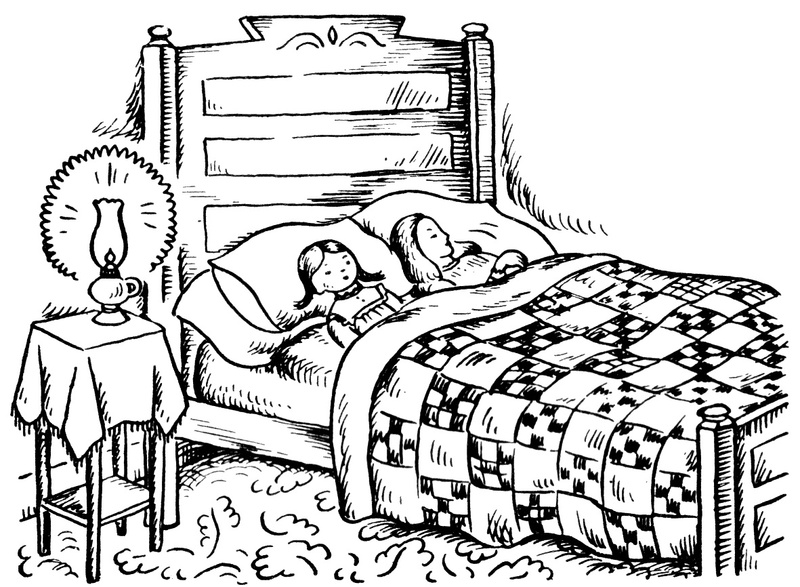 Maud (Betsy) shared the upstairs front bedroom with her older sister Kathleen (Julia). The window in her bedroom faced Center Street from which she could see Bick’s (Tacy’s) house. In fact, she could see Bick’s upstairs bedroom window which also faced Center Street. The Hart’s upstairs back bedroom is located at the top of the stairs that ascend from just off the kitchen. This room was used by the Hart’s hired girl (Rena). The Lavens found evidence that Maud’s bedroom had always been a shade of blue or had a blue motif in the wallpaper. The back bedroom used shades of yellow/beige and pink with blue wallpaper and trim. The floors had been painted several shades of brown or gray. These samples will be used to match new paint and similar wallpaper designs to finish the bedrooms. 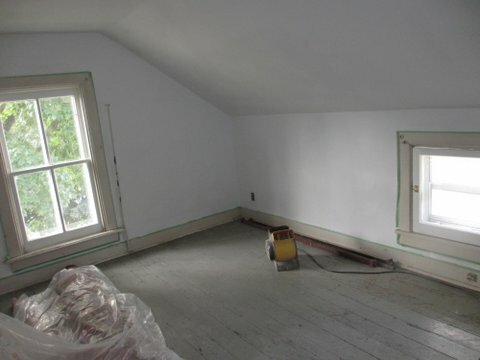 Once the rooms have been painted and wallpapered, they will be furnished to the 1900 era. Items the BTS will need for Betsy’s room include a double or ¾ bed, single bed, night stand, wash stand, chest of drawers, rugs, curtains, period clothes for the closet, and toys. Stay tuned for more progress updates. You are invited to a Book Release Party! Join us as we celebrate the re-release of Maud and Delos Lovelace’s first collaboration on a historical fiction novel, One Stayed at Welcome. This book was first published by The John Day Company in 1934. After 79 years, it is now back in print with new cover art and an afterword. 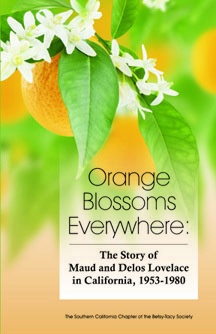 Also re-released is Orange Blossoms Everywhere: The Story of Maud and Delos Lovelace in California, 1953-1980. The Southern California Chapter of the Betsy-Tacy Society first made this available in 1997 as a spriral bound edition and it has been out of print for a number of years. The new edition is a bound soft-cover book with a full-color cover, updated material and new pictures. There will be door prizes, treats and refreshments, book sales and signing. These books are limited editions published by Minnesota Heritage Publishing. Don’t miss this opportunity to add these books to your Lovelace library! Announcing two new Lovelace related books from Minnesota Heritage Publishing. Pre-publication orders are being taken through October 15, ensuring delivery by the release date of November 2, 2013.